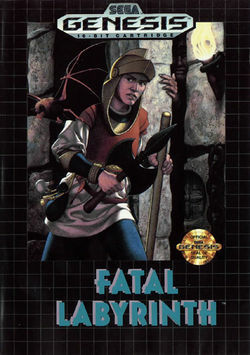 Fatal Labyrinth is a roguelike RPG by Sega that was released for the Genesis in 1991. It is a dungeon crawl game that doesn't have a lot of depth but can be fun if you give it a chance. In Fatal Labyrinth you are a hero that is has made it his mission to climb up a 30 level labyrinth to battle a dragon who has stolen the Holy Goblet. The plot is pretty generic and is really just a backdrop for the game. The levels are randomly generated at the beginning of each game. While the floor plans of the levels are the same the order in which you ascend them is different each time. What is on each level is different between games. The enemies, traps and loot you find are different each time you play the game. This game has a fighting style that is a bit weird. To fight enemies you need to bounce into them instead of the traditional A button hacking. The system works fine but I didn't like it, when I'm hacking away at an enemy it feels like I'm doing something to help in the fight. In this game when I bounce off an enemy for an attack it feels like the outcome is completely random. This game has a magic system which the bad guys use against you but your character doesn't have any magical skill. Instead you search through the labyrinth to find canes, scrolls and potions that you use as a one time magic device. It works the same as regular magic with the biggest difference being if you don't have one of the magical items you can't use the magic. And because you can only hold so many of the items in your inventory in the later levels you will need to decide what you can pickup and what you have to leave. The most irritating thing in this game by far is the magical spell used against you that makes you feel like dancing. When it's used on you the game moves your character in a random direction which drives me crazy. In reality it seems like a terrible idea for the bad guy to use because he has to keep moving to try and attack you and while you're dancing your health regenerates. This brings me to the health system. Each level you go up increases your hit point which is normal and you can use a potion to restore your hit points if their low. The only other way to increase your hit points when their low is by waiting and because each time your character moves a turn goes by you need to keep moving until your health filled up. On the last level before the end boss I had to walk back and forth before going up the stairs to fill up my health. This can have a side effect that if too much time goes by the enemies you already killed will re spawn and you'll need to fight them all again. The game itself does get a bit repetitive but it helps out with newer and stronger enemies to fight as you get higher in the labyrinth. To keep you on your toes there are also random spots that when you walk on it the floor gives away and drops you to the floor below. These pits can get very annoying as time goes by, especially when it drops you into a room full of enemies. In your journeys up you also need to keep feeding yourself. You have a food number and as you work your way through that number drops so you'll need to keep an eye out for food. If you eat too much though you get too full and can only walk slowly until the number drops enough. Some of the enemies magic spells drains your food so you want to make sure you eat when you see food. You don't want to drop dead from hunger. The game has a basic leveling up system. When you get enough xp you level up and your stats increase but it's all don't automatically. Nothing like newer RPGs where you pick the stats you want increased. Sometimes you'll be stuck and can't find the stairs to the next floor so you'll have to start checking each wall for a secret door. These become annoying because there is no clue where they can bee. Sometimes when you've cleaned out rooms and there is a black space in the middle of it you can safely bet there is a secret door hidden to it. It's another annoying thing about the game. The game contains your standard dungeon crawl enemies. One enemy you don't see typically are ninjas. Keep away from the ninjas because while your fighting another enemy, or even the ninja, they will rob you off your gear. Always go for them first unless you want everything you've found stolen. You'll run into dragons near the top of the labyrinth which includes the final boss. He wasn't to hard to defeat you just need to watch out for the dancing spells which he uses again and again. As Fatal Labyrinth was an early Genesis game and the graphics aren't very good. If you didn't know better you might think it was an 8-Bit game. Unlike lots of RPGs from this era when you change weapons or armor your character shows that which isn't ground breaking but is a nice feature. Fatal Labyrinth is a dated game that has some parts that can get under your skin but if you're looking for a light RPG that is different every time you play than Fatal Labyrinth could be for you. And if you're pressed for time than this is defiantly the game for you as it took me under four hours to complete the game. I would give Fatal Labyrinth a 5 out of 10.